Though not all newly planted trees require staking, some do. Hopefully I can help you determine if your new tree needs staking and which staking method might be best if so. If the tree you purchased and planted came with a stake, it is always best to remove it. Reason being, a stake tied close to a tree trunk might help it to grow straight when young and growing in a nursery pot, but in the long term this stake won't allow the tree to develop a strong trunk that will stand straight and sturdy on its own. You only want to stake a tree after planting if it absolutely needs the support. Staking a young tree that doesn't need the support can cause a tree to grow fewer roots and/or a weaker trunk, which would otherwise help to support the tree to stand straight on its own. Needless to say, new trees that start to lean or won't stand on their own after planting should be staked. Taller trees planted in a windy site, especially top heavy ones with a lot of foliage, will benefit from staking until their roots have expanded sufficiently to stabilize the tree against wind. Taller bare root trees will often require staking in order to stand straight after planting. Container or field grown trees with a sturdy trunk and solid root system surrounded by soil might not require staking. If the soil in the planting area is very soggy or loose, staking may be necessary. There are several tree staking methods to choose from. Which one you use might depend on the height and overall size of the tree, the condition of the native soil surrounding the planting hole, and susceptibility to wind. Note: As mentioned above, if your new tree came with a stake attached to the trunk remove it. If it's a sturdy stake, you may be able to reuse it if using Staking Method 1 below. 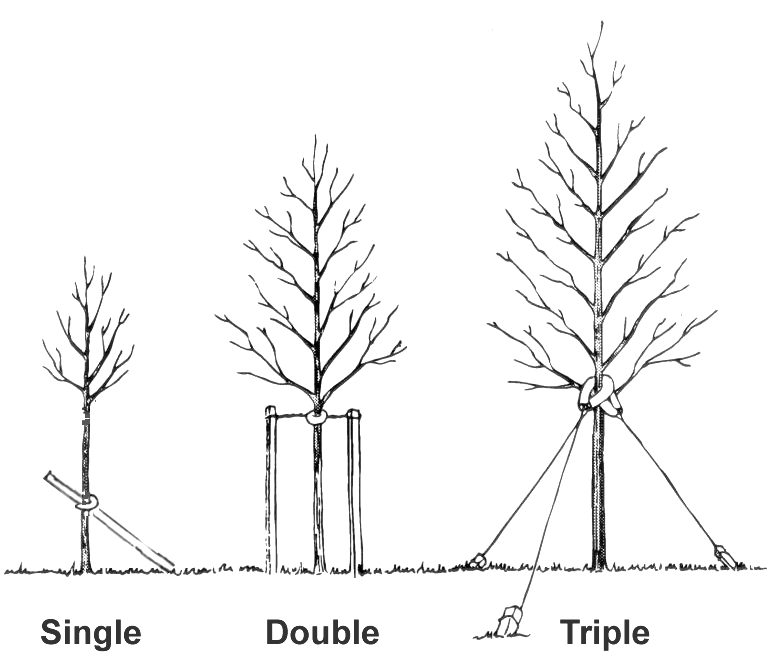 For smaller trees or tall shrubs under 8 feet in height, the single stake method usually provides sufficient support. To use this staking method, simply drive one 4 to 6 foot long stake firmly into the ground so that it crosses the trunk of the tree at an angle a foot or two above the ground (depending on height of tree). Use stretchy tie-tape or a piece of cloth or other soft material to tie the trunk against the stake. Loop the cloth around the trunk of the tree and then cross the ends over one another before looping and tying around the stake. Doing so puts some soft material between the stake and the trunk of the tree, preventing damage that can be caused from the stake rubbing against the tree trunk. Avoid using metal wire or string as a tie directly against the tree trunk as it can cut into the bark causing serious damage. For the double stake method, drive a 5 to 6 foot stake vertically to a depth of at least 18 inches in the ground and about 18 inches away from the trunk on opposite sides of the tree. Use a soft material, such as canvas or tree staking straps, to attach the stakes to the tree. Leave a little slack to allow the tree to sway some. Alternatively, you can use rope or wire for straps, but make sure to use rubber hose or tubing around the wire where it will come into contact with the trunk of the tree. I often use sections of an old garden hose. This method is often used on larger trees of 8 feet or more in height that have a canopy atop a bare trunk. When using this method space three 18" long wooden or metal stakes evenly around the planting hole. Regarding how far to space the stakes from the tree, for every foot of height to the point where the wires will attach to lower branches/limbs, you'll want to space the stakes an equal distance in feet from the base of the tree. For example, if you'll be attaching the wires around branches that are 4 feet above the ground, space the stakes 4 feet away from the tree. After the stakes have been positioned, drive them at a 45 degree angle into the ground beyond the outside perimeter of the planting hole, leaving at least 6 inches of the stake above the ground. Use wire or nylon string to tie from the stake to the tree. Leave a little slack in the wires to allow the tree to sway naturally. To prevent damage caused from the string or wire rubbing against the tree trunk and branches, use rubber hose or tubing around the string or wire where it will come into contact with the bark. The goal in staking is to allow a newly planted tree the time to develop enough roots so it can stand up straight on its own without leaning. Generally speaking, this usually takes at least one growing season, but might take a little longer for slower growing trees and maybe less for faster growing trees. Weather and soil structure are factors as well. To be on the safe side, if you stake a newly planted tree in late winter or early spring, wait until late spring to early summer to remove the stakes. If you plant and stake in early to mid summer, wait until mid to late fall to remove steaks. If you plant and stake in early to mid fall wait until mid spring to remove stakes. If you plant and stake while the tree is dormant in winter, wait until late spring or early summer to remove stakes. Note: Keep in mind that if you leave stakes on too long the tree won't grow in a way that it can stand straight on its own.